I wasn't going to post another rhubarb recipe. Honestly I wasn't. But these Rhubarb Cheesecake Bars are just too good not to share with the rhubarb lovers out there. Last year we divided our rhubarb plants, and I wasn't sure if I would be able to harvest very much this year. Luckily I ended up with way more than I expected. This spring my rhubarb plants looked so puny and pathetic. I didn't want to harvest too much and kill the plants. After carefully pulling what I could, I just barely had the 4 cups needed to make Rhubarb Custard Pie. I thought that was it for rhubarb this year! But amazingly the plants seemed to take off very late in the season with all kinds of new growth. Then, my neighbor told us she wanted to get rid of her rhubarb plant. Her plant is a different variety than mine—mine is more red and pink, and hers is more red and green. So, not wanting any rhubarb to go to waste, I froze what I could harvest from my neighbor's plant and had my husband transplant her plant into our garden. And, I made these Rhubarb Cheesecake Bars for us and our neighbor. Next year I should have even more rhubarb. 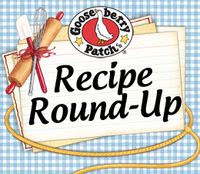 . . and even more rhubarb recipes to try! 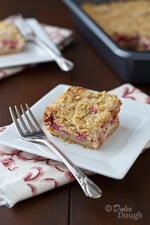 A great way to enjoy rhubarb--crumb bars with layer of rhubarb cream cheese in the middle. 1. Combine flour, oats, and brown sugar in a small bowl then use a pastry blender to cut in the butter until crumbly; reserve 1 cup of crumb mixture.2. Lightly grease or spray a 9-inch square baking pan then press the remaining mixture into the bottom of the pan.3. For the filling, beat the cream cheese and sugar together in a small bowl; add the salt, vanilla, cinnamon, nutmeg, and egg; beat until well combined.4. Fold in the rhubarb and pour over the crust; sprinkle the reserved crumb mixture over the top.5. Bake at 350° for 35-45 minutes or until set; cool on a wire rack for 1 hour and then refrigerate for at least two hours before cutting into squares.Note: If using frozen rhubarb, measure the rhubarb while frozen and then allow to thaw completely. Drain in a colander, but do not press the liquid out. I wish we were neighbors! I'd gobble these up like there's no tomorrow! You are right, these cheesecake bars looks delicious. I may need to find rhubarb now. i tried few years ago to plant some rhubarb but didn't grow and ended up buying some from the farmers market when is season. I haven't seen fresh for few weeks now, will have to wait till next year. This recipe sounds like a keeper, I love tart rhubarb desserts and pairing with cheesecake (one of my favorite desserts of all time) sounds delicious! You're making me want to try cooking and baking with rhubarb. The photos are splendid! You're so good at composing your food photos. I'm a fan! What's not to love. With all those flavors and ingredients combined this has to be a winner. YUM! What a delightful way to use rhubarb...you can always through some extra rhubarb my way (harvested...no where to plant them, lucky you!)! Can't wait to make these in the fall! I froze a bunch of rhubarb this year and it's just waiting for this recipe! Love anything rhubarb and these bars look absolutely delicious! This looks delicious, I'm sure that my kids will love this.